No glue or paint required! Includes the detailed ghost hunting equipment on the vehicle from the movies. Novice modelers can affix decals and apply their own paint, too! The Ghostbusters are on the roll again with this release of the original 1:25 scale Ecto-1 vehicle model kit. 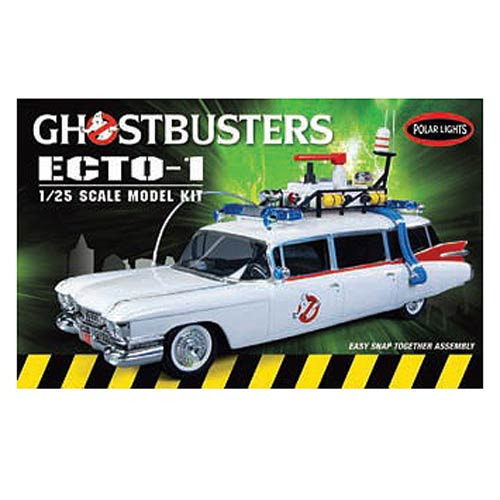 The Ghostbusters Ecto-1 1:25 Scale Snap-Fit Model Kit features the detailed ghost hunting equipment you remember from the film. Snap-fit assembly and stickers allow assembly by novice modelers but decals are supplied and the kit can have details painted detailed out by advanced modelers, too, making it an appealing project for builders of any skill level. Ages 10 and up.